“Paksiw na isda” – a vinegar-based fish recipe is my most-cooked and often consumed Filipino dish ever since I learned how to cook. Living in a coastal town in Philippines, we had access to fresh saltwater fishes and seafoods everyday. 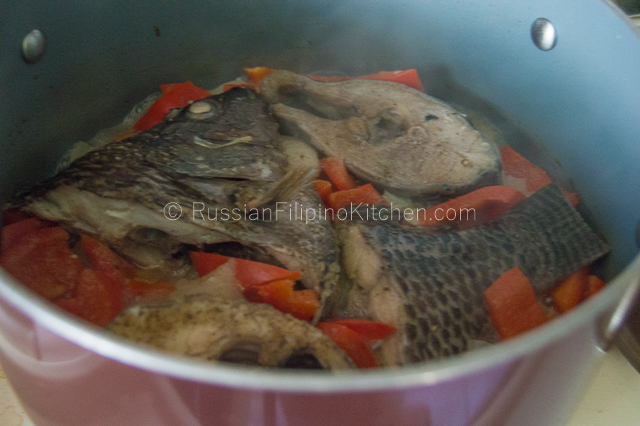 I had fond memories of my dad coming home before breakfast with a plastic bag full of fresh fish and asking my mom to make his favorite fish soup –tinola. He bought them from local fishermen (mostly his friends) hauling in their catch for the day at the beach. Growing up, my family’s main source of protein came from fish, as they are cheaper compared to meat products. 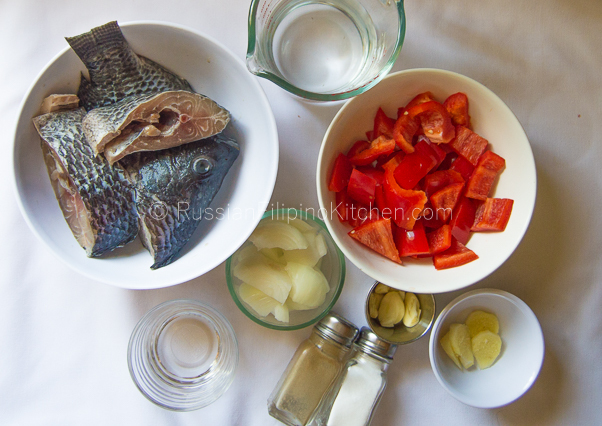 Fish is an integral part of the Filipino diet and we cook it in a variety of ways – fry, boil, grill, put in soups, cooked in sweet and sour sauce, etc. The most common method I know of is turning them into fish paksiw, otherwise known as “inun-unan” in my native Cebuano dialect. “Paksiw” is basically a method of cooking meat and fish in a concoction of vinegar, water, garlic, onions, ginger, and some spices—almost like cooking adobo without the soy sauce. “Isda” (Filipino word for fish) can be of any type. For this recipe, I use tilapia, as it’s very common, inexpensive, and easily found in most grocery stores in the US. This is a very quick and easy recipe that is well-loved even among some Russian friends we have who love fish. 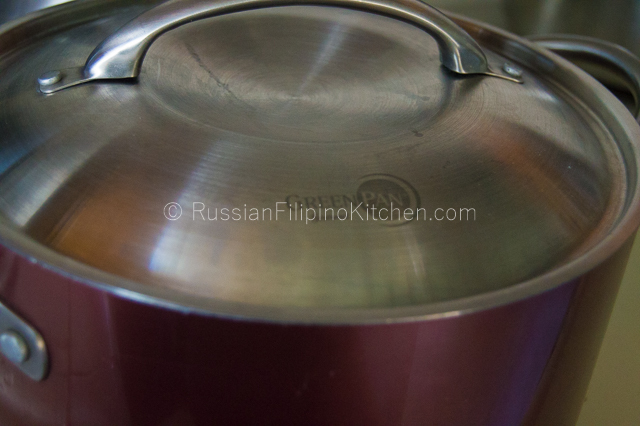 As most Filipino meat or fish dishes, it’s best eaten with plain boiled white rice. 1. On the bottom of a pot or skillet, arrange bell peppers, onions, garlic, and ginger in one even layer. 2. Add fish slices next, placing them in a single layer as well. 3. Add water and vinegar. 5. Cover and bring to a boil. 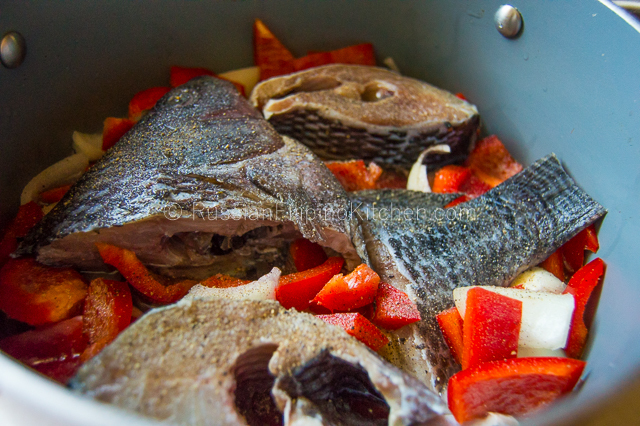 Once it starts boiling, turn down heat to medium low and simmer fish until most of the water has evaporated around 12-15 minutes. 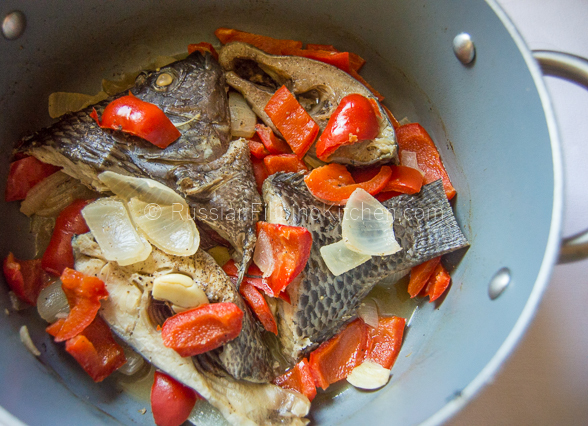 While fish is cooking, scoop some of the liquid and pour into fish. Do it a couple of times, and then put the lid back on to finish cooking. 6. Serve warm with boiled rice. 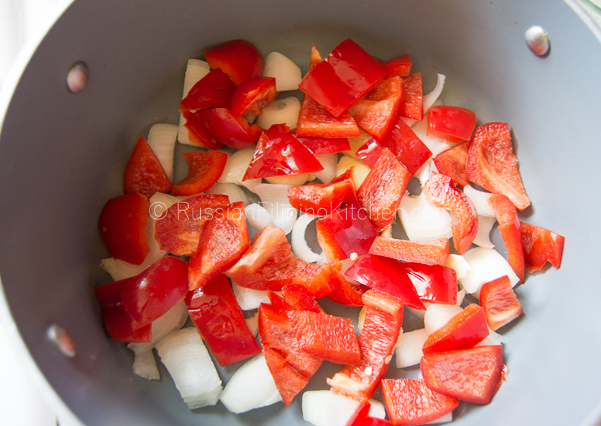 On the bottom of a pot or skillet, arrange bell peppers, onions, garlic, and ginger in one even layer. Add fish slices next, placing them in a single layer as well. Cover and bring to a boil. 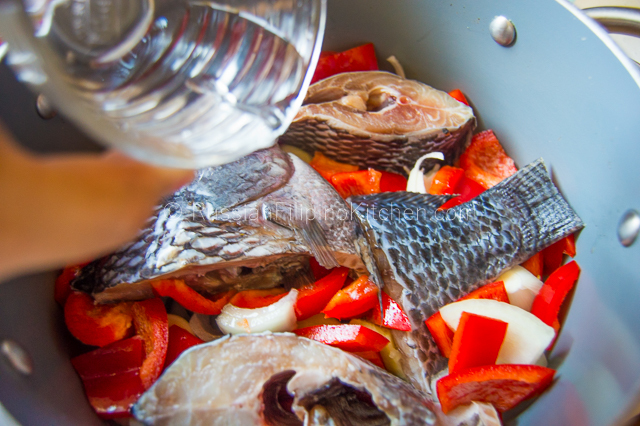 Once it starts boiling, turn down heat to medium low and simmer fish until most of the water has evaporated around 12-15 minutes. 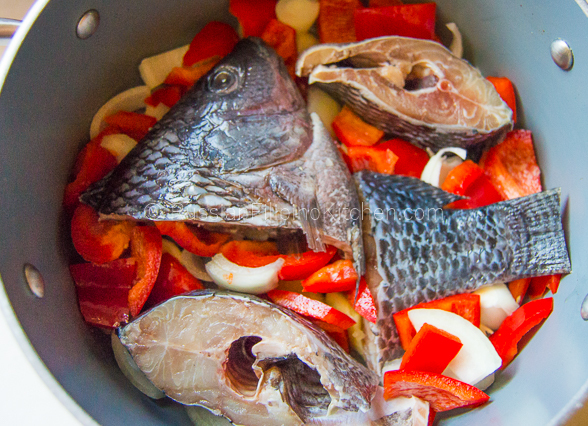 While fish is cooking, scoop some of the liquid and pour into fish. Do it a couple of times, and then put the lid back on to finish cooking. Serve warm with boiled rice.